MUST READ Before You Hire a Wedding Photographer – Avoid These Common Mistakes! …Who is a friend, cousin, or an amateur – I know you really love Ashley and Kirstin, (or uncle Bob) but you risk getting poor quality images, or no images at all! They may take good pictures, but they may have no clue about the rigorous discipline needed from start to finish, and can’t prepare for unplanned situations. It’s you one-and-only wedding… do you want to risk it? …Generally less than 10 months before your wedding (aim for 12-18 months). The good photographers go fast, and last minute decision to hire a photographer makes planning rushed and an engagement photo session have less value. …Who fails to provide reviews and samples of their own work and review by their clients – see what others are saying! …If you focus too much on price! Great photography and quality – for something you get to do once – takes planning, time, experience, and effort. You get what you pay for! …Who doesn’t know how to expertly handle camera settings: exposure, white balance, ISO, shutter speed, subject framing, proper use of lenses, macros, on and off camera flash/lighting. …Without a mature Work-Flow! If they’re either new, or haven’t taken the time to plan the 10,000 steps required to make good photos, then you run the risk of missing many critical details. …Who doesn’t immediately back up your photos. Lost digital files can never be restored. …Who can’t find the happy balance between being outgoing and being discreet/ a fly on the wall. The client is the center of the attention, not the photographer! Plus, you should like them! …Who doesn’t offer to join you on a “Venue Walk Through”! 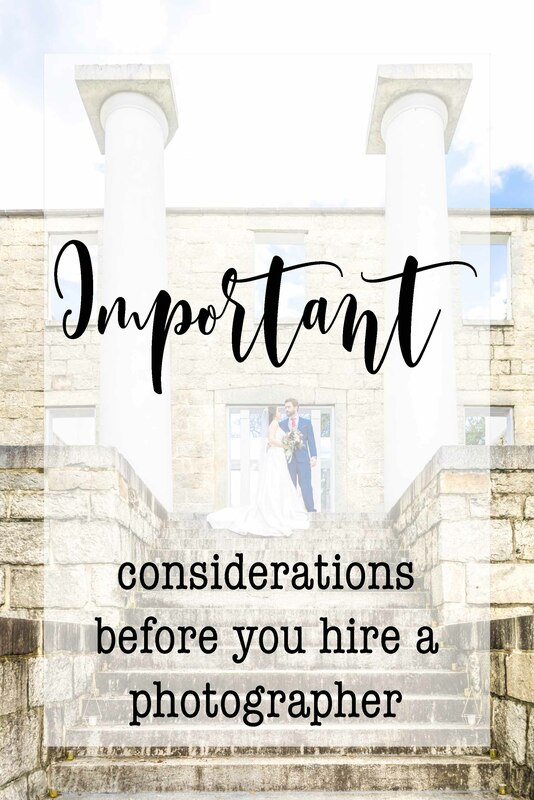 It is imperative that the photographer visit the venue to better understand logistics, make lists of desired photos, and check out the lighting conditions and limitations. …Who won’t create a Photography Plan for your Wedding Day. This assures you that he/she thoroughly thought about all the steps and wants to reassure you everyone is synced. …Who doesn’t have redundant equipment, or professional-quality full-frame cameras! In the event something goes wrong, the photographer must have back-ups! …Who doesn’t really know how to edit photos in post-production. Correcting exposure and white balance is imperative! Otherwise you’ll get orange or purple skin tones, or shoddy contrast and exposure. …Who uses press printed products or doesn’t use professional developing and fine art labs that make exceptional photo paper products, lay-flat and flush-mounted albums. …Who doesn’t use a professional 2nd photographer or assistant who has professional and redundant equipment. Do you really want a newbie or little Johnny to be your 2nd shooter?